Former Disney star started tour in February 2014. Throughout her Bangerz Tour, the popular Nashville singer shined in every show performed in the different cities that served as a platform to showcase the talent of this former Disney girl. After a hot and sexual scene in which she rubbed herself against a golden car, Cyrus gave away dollars with her face printed on them. A rather peculiar and original detail that the fans could keep as a souvenir. 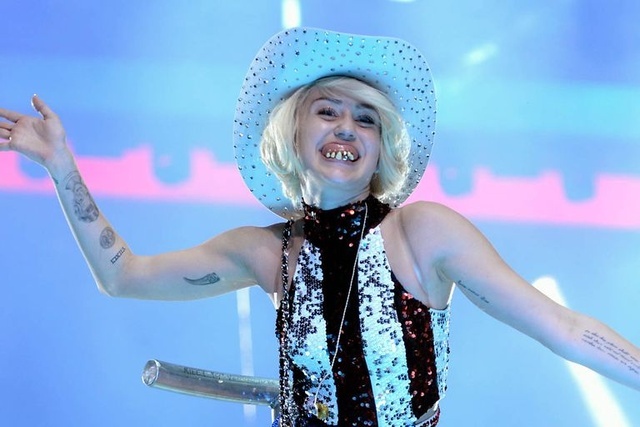 Seeking to generate greater empathy with her audience, Miley Cyrus took any object that fell near her on stage and if it could be worn, she putted them on. From thongs and glasses to teddy bears and a dreadlocks wig hat, she managed to always please her fans. Surely you have heard of these unique women who are always accompanying Miley on stage and really seeing them in action you can appreciate the particularity of both and the original touch that these give the show. Throughout his presentations it was possible to observe that he carried with him a crossed bandolier style bag or a backpack of small size where. It is a huge mystery what was she carrying inside them. An act which without any doubt impressed more than one of the Bangerz Tours assistants, because not she only went up to this one but also rode it as if it were a rodeo horse.